Dunbar and Boardman: How did the Schindler Group become so successful? Today the Schindler Group is one of the top four elevator manufacturers in the world, has over 50,000 employees in over 100 countries. Schindler manufactures, installs and services elevators and escalators. Schindler elevators and escalators move 1 billion people every day but it wasn’t always this way. How did the company get started? In 1874, twenty years after Elisha Otis was demonstrating his elevator brake at the New York World’s Fair two Swiss gentleman, Robert Schindler and Eduard Villiger founded a general partnership company in Lucerne, Switzerland. The company was called Schindler and Villiger and the company opened a mechanical workshop on an island in the Reuss River in Lucerne, Switzerland. The workshop produced lifting equipment and other machinery. 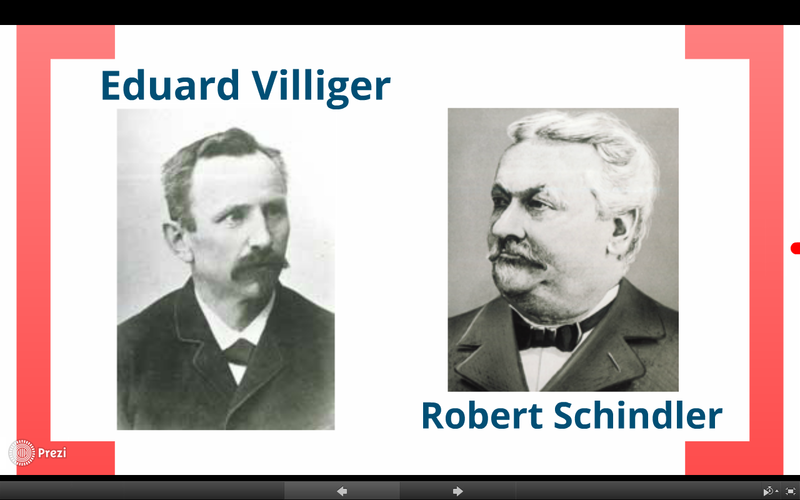 Few details of the early lives of Schindler and Villiger are known. The Swiss reputation for privacy is well earned. Once the company was established Schindler and Villiger wasted no time in building the business and increasing its scope of activities. 1878: The first Factory regulations include a 63 ½ hour week, a 14 day notice period, and accident insurance. 1890: Delivery of first Hydraulic freight elevator. 1892: Eduard Villiger leaves the partnership. The company continues under the name of Robert Schindler Machinery Manufacturer. / The first electric elevator with belt drive is built. Schindler's most important customers during its first years were large hotels and production plants, first in Lucerne and later throughout Switzerland. 1894: Introduction of the 59-hour week. 1895: The factory is extended and an iron foundry is added. 1899: Schindler elevators were equipped with worm gears and controlled by a pull rope. 1901: Robert Schindler sold the business to his brother Alfred Schindler, who became the new sole proprietor and changed the firm's name accordingly. 1902: The first electric passenger elevator with automatic push button control is delivered. 1906: A new business partner, Fritz Geilfuss, joined the company and it became a partnership, Schindler & Cie.
1906: Schindler opens its first subsidiary in Berlin. 1907: Agency in Lausanne established. 1908: Schindler builds houses for 50 Schindler workers in Littau. Agencies in Zurich and Basel established. 1909: Delivery of first multi speed electric elevator, driven by an Oerlikon two speed motor. Schindler and Houplin is founded in France. 1910: The first elevator with a single-phase commutator motor is delivered. Agencies in Bern and Argentina established. 1911: – Agencies in Turkey, Algeria, Russia and Italy established. Why were Schindler successful when many others failed? As this timeline demonstrates international expansion and product innovation laid the foundations for the future success of Schindler. After 1911 Schindler expanded into more European countries and by 1931 had even reached China. In the late 1960s expansion through corporate acquisitions became the preferred strategy and many smaller companies were acquired around the world. This proved to be a very successful strategy that explains their presence in over 100 countries today. Dunbar and Boardman is the lift, escalator and access equipment consultancy. Do you have a current or planned project that includes elevators? We would be happy to discuss any such requirements and how we may be able to assist. Give us a call on T +44 (0) 20 7739 5093 or send us an email via peterboardman@dunbarboardman.com to start the conversation. We look forward to hearing from you.